Beautiful North Peoria 5 Bedroom plus an Office and Loft, 4.5 Baths with 2 Masters. Granite Counters in the Large Kitchen with Center Island, Walk-in Pantry, Extended Dining Room open to Spacious Great Room with Surround Sound Prewire. Extended Downstairs Master Bedroom with Bay Window, Separate Shower and Luxurious Deep Soaking Tub, Walk-in Closet. Big 2nd Master Bedroom upstairs has 2 Closets. 3 Car Garage and Laundry Room. Refrigerator, Washer and Dryer included. This Energy Star Home has Radiant Barrier Roof Decking, Low E Windows, high Efficiency 14 Seer AC, Gas Heat. Home has EcoBee Smart Home Thermostats with Alexa Built-in. Approximately $60,000 in Upgrades, must see! 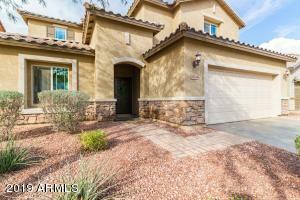 Close to Lake Pleasant Pkwy and Happy Valley Shopping, Schools, Churches, Golf and Fine Dining. Near Loop 303, I-17 and Loop 101 for easy access to all areas of the Valley. Minutes to Lake Pleasant!